For our 7th and 8th graders, the Exploratory program offers them the chance to discover new talents. Mary Helen Bever has done an incredible job growing this program to offer more classes for the students. From coding to drama, our students get the opportunity to learn more about themselves and new subject areas. The Celebration of Learning is a chance for the students to show the community what they've learned in their exploratory classes. It's always fun for me to hear our students practicing and rehearsing, then hear about how impressed parents are with the students. Even though seating is at a premium, I'd encourage parents of younger kids to try to come, too, just to get a sneak peak at what's to come in 7th and 8th grade. Another great opportunity to get together is the Math Carnival. This event is one of the best community builders we have, and it's a great educational experience for our kids (and their parents). Please try to attend and enjoy the wonderful people who are part of this community. A special thanks to Peggy Aman who envisioned this night and makes it happen. Finally, please be sure to send in items and donations for Outreach day this Friday. All monetary donations support the students we help in Kinango, Kenya. It only takes $700 to send a student to high school for one year, so it's not an unrealistic goal to have one class sponsor one student. The items we collect—food, sleeping bags, toiletries, diapers, etc—go to worth​y​ causes in our area who depend on our help. Thank you for giving/donating generously. 3/10 - St. Patrick's Day PartyThis event has been cancelled. 3/19 - The Gift of Failure Auditorium 5:30pm-8:30, RSVP here! There are a variety of ways to help at St. Joseph. Sign up today to volunteer or visit the website to learn more. We are in need of the following volunteers. Spirit Gear Seller - On-going, more information here! Come explore math with your children!! Learn games that help make math easy and fun for your family. Drop in for a few minutes or stay the whole time. Win a free lunch for your class! 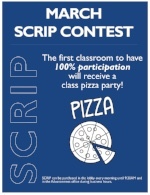 The first classroom to have 100% participation in our Scrip Program will win a special lunch! The classes will be competing against each other for the month of March. Scrip can be purchased every morning in the school lobby from 8:15AM – 9:15AM and in the Advancement Office during office hours. View the most current Scrip Form here – please note, we have a list of commonly stocked cards, the remainder of cards can be special ordered. Special orders are placed twice a month and will be made on the 12th and 26th of March. St. Joseph's School is proud to welcome author Kelly Jones for Young Authors Week, April 17th and April 18th. Kelly Jones is a curious person, interested in chickens, magic, farm life, spies, sewing, the odd everyday bits of history, how to make sauerkraut, how to walk goats, superheroes and what makes them so super, recipes to make with a lot of eggs, anything with ghosts (particularly friendly ghosts), how to draw chickens that actually look like chickens, and any story she's never heard before. 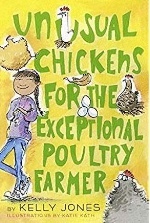 Students have the option to pre-order her book, Unusual Chickens for the Exceptional Poultry Farmer which she will autograph on the day of her visit following her presentation. We are looking forward to her visit! Click HERE to access the order form. To learn more about Kelly Jones please visit her website. All pre-orders are due Wednesday, March 23rd 2018. Books sales provided by Elliott Bay Book Company. To learn more about Elliott Bay Book Company visit elliottbaybook.com. St. Joseph Parent Association Board (PAB) Needs You! Join the PAB in our mission of supporting and enriching our school community. Contributing your ideas, experiences and talents is key to our success, not to mention a great way to earn your volunteer hours! So come join the fun! Send the materials listed below to pab@stjosephsea.org by March 30th. Please include a brief personal & professional bio, previous volunteer experience, and grade(s) of student(s). Track and Field registration is now live on the St. Joseph School website. Register your child now for K-3 Track Club or 4th-8th Grade Track and Field. Cost is $10 for K-3 Track Club and $25 for 4th-8th Grade Track and Field. Save the Date! Grandparent Luncheon Friday, May 11th. The annual Grandparent Luncheon will be held immediately following the May Crowning Mass. If you would like to have an invitation sent out please complete the form HERE. Please make sure to submit by March 9th. The Jaguar Club will again be hosting the WATTS basketball workshop during the noon dismissal on January 16th. Click HERE to learn more details or to register your child. Re-enrollment for current students will begin on 3/16/18. Families will receive an email from FACTS to access contracts and set up payment plans. Applications for prospective 18/19 students were due on 1/26/18. Please contact Admissions today if you've missed the prospective student application deadline. What's the best way to motivate students to take ownership of their education, help them learn deeply and durably, and develop emotional and intellectual resilience? The key, research shows, lies with intrinsic motivation, or motivation that comes from within. Come listen to author Jess Lahey speak about how teachers, parents, and coaches can help kids discover intrinsic motivation by fostering autonomy, competence, relationships, and personal relevance. Lahey will share how parents and educators can give students the support and encouragement they need in order to stay motivated over the long term. *Books will be for sale onsite or to purchase in advance, click here. For more information or to volunteer, please email Shawn Needham. March 14th is π day. St. Joseph has an annual pie raffle to support the Leukemia and Lymphoma Society. The pies will be on display in the lobby. Come and check out the pies and decide on the one you hope to win. $1 per ticket!! We will have official University Book Store bookmark templates available in the library. This year's theme is "Read and Take Flight." I will announce the contest to all K-6 classes and will let the 7th and 8th grade students know via Mr. LeTellier's and Mr. LaCasse's ELA classes. This is not a mandatory event. Students take part only if they want. All artwork must be done by the students. When bookmarks are complete, students will turn it in to the St. Joseph School Library by the morning of Friday, March 31st. We will submit all completed bookmarks to the University Book Store by the deadline, Friday, March 31st. No late submissions. Winners will be announced by the University Book Store. We will make color bookmarks of all submissions for distribution in the library. We hope this is a fun event for all participants! ADHD, Relationships and Families-Happy Hour Date Night - Dr. Edward Hallowell and Melissa Orlov. Friday March 9th, 6:00 PM-9:00 PM. 505 Market Street, Kirkland, 98033. To register and purchase tickets, click here. ﻿Wise Minded Parenting Videos with Dr. Laura Kastner- FREE VIDEOS. Parent Toolkit-An amazing resource for parents is called Parent Toolkit, Pre-K-12th Grade. Great article! What Kids Want You To Know-From 5-15. As always there is a wealth of information and resources for parents on my Weebly webpage. Click here to access K-8th grade developmental sheets, program information, community resources and parenting education. ﻿Mark your calendars FORE this not-to-be missed event. Start working on those foursomes! Stay Tuned...more information to follow. Auction Parties: There are still some amazing parties that you can be a part of — to learn more and sign up click here! The first of the two year Sacramental Preparation program for First Reconciliation and First Eucharist is called CFF1 (Children's Faith Formation Year 1) and is for children in first grade or older. Please sign up your child here. Mark your calendars for the CFF1 parent and child "Welcome Workshop: Exploring the Church" on Saturday, May 5 from 9am to 11am in the church. No fee! 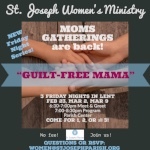 Join us in the parish center! 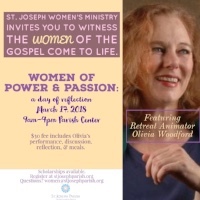 St. Joseph's Women's Ministry invites you to our Lenten Day of Reflection featuring Olivia 's performance of her one-woman play "The Heart of the Cross." Her presentation will transport us back in time to the foot of the Cross to experience Jesus' Death and Resurrection through the eyes of the women who witnessed these events. Please join us for our Lenten Mass and Potluck Supper on Friday, March 23rd at 6 pm in the Parish Center. Fr. John Whitney, SJ is presiding and Matt Tilghman-Havens will lead us in song. Back by popular demand: MEATLESS Lasagna provided! Please bring a salad, bread or side dish and beverage of choice to share. RSVP via email to Steve or at 206-965-1646. Deepen your experience of Lent this year by entering into Nine Days of Grace: Novena, a retreat that can be made amid our busy lives. Take just one hour a day to attend a liturgy at either the Chapel of St. Ignatius or St. Joseph Church, or make the retreat online. Click HERE for details including dates and times. 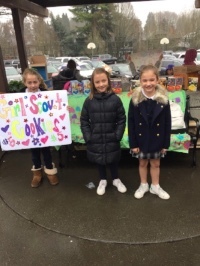 Annual St. Joseph Girl Scout Cookie Troops Sale! Join us for a Brave Summer! Our summer camps, held on Bishop Blanchet's beautiful campus, are designed to appeal to a range of ages, skills and experience levels. All students will enjoy the opportunity to meet new friends and learn from our dynamic coaches in a supportive, fun environment.